From its beginnings, the history of Calgary is a not just a story of humans, but one of animals as well. The fur trade, cattle ranching, and the Greatest Outdoor Show on Earth have all left profound marks on the city’s culture and geography. This year’s Community Seminar, “Calgary: City of Animals,” will explore the history of Calgary from the perspective of the non-human animals with whom we share the city’s spaces, and which have helped to shape the city’s past, present and future. The relationship of animals and humans has been the subject of philosophical and ethical reflection since ancient times. In our contemporary world, the question of our relation to animals has become one of increasing relevance and indeed urgency. From new developments in animal cognition, to concerns about mass extinctions, we are challenged to think anew about how we live with animals. In the academy, the rise of the field of Animal Studies has brought new attention to the question of the animal, and the roles that animals have played in human history. More recently, the perspective of Critical Animal Studies has pushed the boundaries of this questioning even further, considering the moral and legal rights of individual animals. This year’s seminar will take up some of the issues in relation to our own city and community. 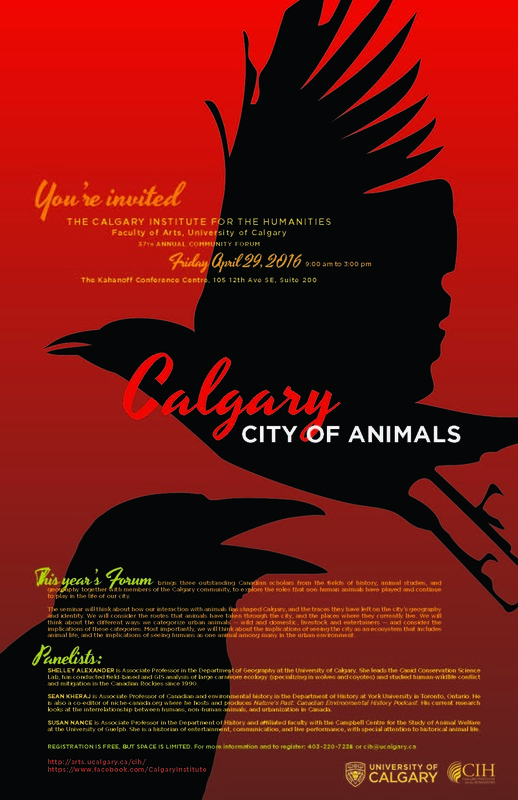 “Calgary: City of Animals,” will bring three scholars from the fields of history, animal studies, and geography together with members of the Calgary community, to discuss the role that non-human animals have played and continue to play in the life of our city. The seminar will think about how our interaction with animals has shaped Calgary, and the traces they have left on the city’s geography and identity. We will consider the routes that animals have taken through the city, and the places where they currently live. We will think about the different ways we categorize urban animals — wild and domestic, livestock and entertainers – and consider the implications of these categories. Most importantly, we will think about the implications of seeing the city as an ecosystem that includes animal life, and the implications of seeing humans as one animal among many in the urban biome.